Looking for a new activity for yourself or your children to get involved with this year? Join our nearly 200 students who are enrolled in private lessons. We welcome children just discovering music, kids and teens looking to improve their skills, adult hobbyists, and everyone in between. 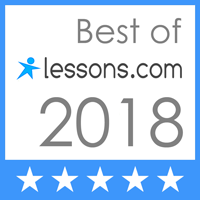 Individual lessons enable students to learn the technique and repertoire that are immediately relevant to their particular needs. They are a vital part of every musician's education. Individual lessons also foster important life skills such as discipline, perseverance, self-motivation, patience, focus, time management, and confidence.